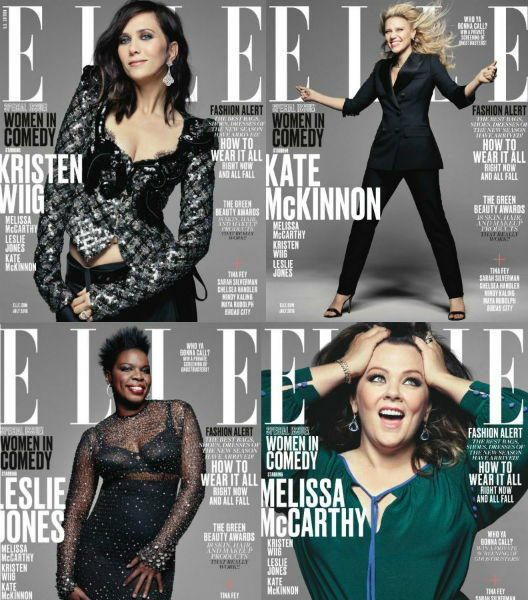 -I love all four Elle covers featuring the stars of Ghostbusters! -Speaking of Ghostbuster stars, here’s photographic proof that Melissa McCarthy is on the set of the Gilmore Girls revival — complete with Sookie’s trademark headscarf. -Speaking of Miranda, his edition of Carpool Karaoke is my new favourite — though I wish he had another song or two before Audra McDonald, Jesse Tyler Ferguson and Jane Krakowski climbed into the backseat. Still, I got goosebumps when they started in on “Seasons of Love,” and Audra‘s final note on “One Day More”? Jesus. -Meanwhile, James Corden explained to Stephen Colbert how Carpool Karaoke went from a lowly sketch idea to a phenomenon. -Meanwhile, TMZ continues to work for Team Depp. -Speaking of the CFDAs, this might be my favourite look ever on Jessica Chastain. -A Quentin Tarantino-produced film put out a casting call for “whores” because the world is awful. –Jamie Lee Curtis cosplayed with her son for the Warcraft premiere, a movie she’s not even in. That makes her a pretty boss mom. -Hmmm…this doesn’t bode well: Chris Messina will not be a regular on the next season of The Mindy Project. -Hmmm…I’m so curious which two TV shows fired Kerry Washington for not being “hood” enough. -I wish I could unsee Meryl Streep donning a fat suit and orangeface to impersonate Donald Trump. –Will Smith will serve as a pallbearer at Muhammad Ali’s funeral. -Well, this is terrifying: Jeremy Jordan is trying to save his cousin from a “pray away the gay” camp. -I don’t think Supergirl should cast Superman because he could threaten to overwhelm the show BUT if they must, these suggestions are great. Matt Bomer doesn’t seem realistic, but Scott Porter or Enver Gjokaj? YASS! -An adorable girl vomited on Paula Abdul after dancing to Beyoncé on SYTYCD. Paula, to her credit, rolled with it. -This photo that Reese Witherspoon tweeted from the Big Little Liars set makes me even more excited to see this movie. I loved the book and the cast is insane: Nicole Kidman, Adam Scott, Laura Dern, Zoe Isabella Kravitz, Shailene Woodley. –Selena Gomez caught a fan FaceTiming at her show and got in on the action. –Drake disses Diddy in his new song “4PM in Calabasas.” Slow down, buddy. I haven’t even finished your new 20-track album. –Nick Offerman costars with his dad in a new ad and shows us who he got his taciturn nature from. -I am both terrified and intrigued by Kate Hudson‘s ‘electro shock’ under-eye patches. -It took a lot of work to make Ryan Reynolds look that gross in Deadpool. -Oof. Last night’s season premiere of UnREAL only managed to nab 500K viewers. Good thing we already know there’s a season 3 coming. -The Japanese Ghostbusters trailer reveals more footage.